Pre-race the GingaNinja had indicated that a lack of any training was probably going to hinder her progress and she would consider a single lap without stopping a decent measure of success. I suggested that ASKruns and I would accompany her to provide moral support and also earn the toddler another medal, I would then continue to run the marathon or ultra distance. Registration was quick and easy, we collected a couple of new Wacky Event buffs and pinned our numbers to our fronts. ASK was excited and keen to get going, the GingaNinja was keen to start so she could get finished. We ambled along to the start and stood at the back where we knew the Unirider would cause the least disturbance to the other runners and with conditions being both a bit wet and icy I didn’t want to risk losing my footing. There was also the fact that we were playing the role of cheering squad to help the GingaNinja and so we would probably be going a slightly more restrained pace than usual. ASK and I, as the runners set off, darted ahead of the crowd and hoped that the GingaNinja was following us but the she had been caught in the dozens of runners and so I took my foot of the peddle and let some of the others go past us until we were back together. And we pushed on gently amongst the crowds as they all settled into their rhythm. The route was exactly the same as last year and I say this as a good thing because there’s lots of lovely little twists and turns as well as some delightful up and down hills. ASK and I shouted encouragement to the GN from a position about 10 metres in front of her hoping to ensure that we kept momentum as the lap progressed and it was progressing well. We ran through the trail to the first big challenge on the route which is a frosty downhill before an icy and slick wooden walkway. Most of the runners took the steps down the hill but we took the slightly wilder route to the side and thundered down to the bottom. The GN who was now nicely warmed up followed behind us making good progress through the wintery conditions. One thing to note about running with your toddler is that ‘Scenic’ really helps to keep your toddler happy and the rushing water of the lock, the ducks and the breaking of the puddles of ice with the Unirider served as very happy times as we ran. As we crossed the river bank ASK wanted to do a little bit of running and so she joined both the GN and I and did a few hundred metres before returning to the comfort of her ride. I knew that the ‘big’ hill was almost upon us and given the conditions over the last couple of weeks I suspected it would be slick and muddy rather than a dry and fast climb. ASK and I took a crack at it and although I knew we could do it the GN behind us was ‘advising’ us to walk and once that happened then ASK wanted to do what mummy had suggested. However, my little toddler powered up the hill with greater aplomb than her penguin outfit suggested she was capable of and we toddled to the top in quick time. With the GN back in tow we headed off to complete the second half of the lap. Top of the hill, hurry up mummy! From here we had the lovely Tony as company periodically as we kept overtaking one another and ASK would remind her mum that she needed to go faster to overtake people! Perhaps it was the words of our toddler that kept the GingaNinja going but as we approached the final bridge she was looking in good shape and so I broached the topic of a second lap – sadly this was shot down long before I’d even finished my sales pitch and so we pressed on. 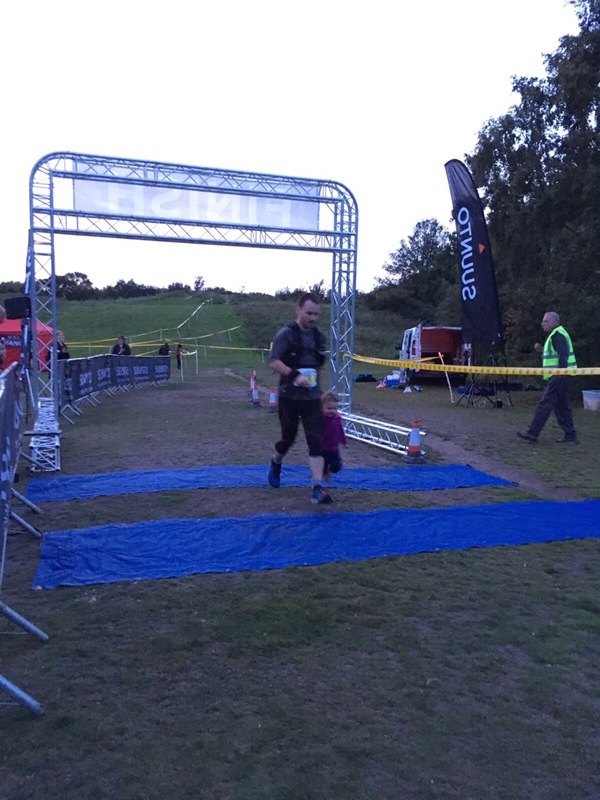 Into the final turns of the event and I knew that the finish line was just ahead – ASK had enjoyed herself and she just wanted a final flourish with her mum. I had decided that I would run her in on the Unirider but the GingaNinja unwisely gave the toddler a choice of running the last section and at 300 metres from the end caused ASK to go into a meltdown. There wasn’t much that could be done at this point other than get her across the line and hope that a medal cured all and in truth it did – well that and a chocolate treat. In truth I was a little bit annoyed with the GingaNinja (and myself for not making my plans clear) as ASK had mostly had a good time on the route, had enjoyed the challenges of the race, had enjoyed the attention she received from the other runners and supporters, had enjoyed chasing and cheering her mum and had really enjoyed getting the medal. But the run up to the finish took away some of the overall good feeling that had been gathered by this truly wonderful end of year event. Thankfully post race we got changed and went back out on to the route to cheer ‘hooray’ as runners went past and this returned some of the cheer to my festivities. The guys at Wacky Events know how to put on a really good event and I would go back and do this year on year if I wasn’t planning on moving to Scotland before this event comes around again. However, I can highly recommend that you take part. It’s wonderfully priced, it’s a really awesome route, there’s a great medal and a free snood/buff/neck gaiter thrown in and combine this all with a feast of savoury and sweet snacks and you’ve got a winter winner. For my part seeing my partner back out running and doing it well, albeit over a relatively short distance was really good and despite the mini meltdown that my toddler had we had lots of fun on one of my favourite looped routes. I’d also like to say a huge thank you to the organisers for letting us run with the Unirider during the event and a huge thank you to all of the amazing volunteers and supporters that littered the route with cheers and waves which only encouraged both the GingaNinja and ASK. This is a story two years in the making as the moment I finished the SainteLyon in 2015 I knew I had found ‘my’ race. My experience was so incredibly positive that I knew I would return and when entries opened in April I was waiting with my debit card to hand ready to sign up. Experience had taught me that this was unnecessary but I wanted my place confirmed as quickly as possible and within a few hours I had also uploaded the medical certificate from the UTBCN, booked my flights and begun the search for accommodation. For more detail on how you go about the logistics can I recommend you read the 2015 report, which goes into much detail about that kind of thing. The first half of my running year had gone quite well, finishing with a great finish at the South Wales 50 and despite failure at MIUT I was feeling tremendously positive overall going into the summer race break. However, the death of my partners mother, illness and injuries to my back meant that my return to training and racing was hampered quite badly. I didn’t show up for the return of the London to Brighton, although I rocked up to the start of the Ultra Trail Scotland: Arran this was cancelled mid race due to terrible weather conditions and I deferred my place at The Rebellion because of a hideous chest infection and a lack of preparation. This all meant that my return to the SainteLyon was incredibly undertrained in fact only just returned to training and in no way ready to face this wonderful course. Regardless I wasn’t going to miss out and on Friday, 1st December I ambled along to the hideous Luton Airport and took the short flight to the delightful Lyon St Exupery Airport a short hop on the Rhône Express took me into the centre of the city (30mins), I bought a 72hour combined Metro, Tram and bus ticket (€15) and took the 3 minute metro ride to Saxe Gambetta where I would find my small but perfect AirBnB accommodation just two minutes from the station. I dropped my bags down to be greeted by the sight of a Nespresso machine and some Belgian waffles and chocolate crepes! Merci Diep (the host). I grabbed a few bits like my passport and registration confirmation before heading straight out to the hall to collect my number. Another short hop on the metro and I was a five minute walk from where I needed to be – awesome. Security was still quite tight in France and there were bag and body searches before entry to the hall – which in light of recent history both in France and across Europe -makes sense. But once in the hall it was like a Mecca for all things trail running and I slowly wandered round deciding what I would spend some pennies on. It was lovely to see Oxsitis with a big stand and lots of products on show and while I may not wear them any longer Hoka also rolled into town with a decent showing. Collection of my number was easy this year and I used my incredibly handy French phrase, ‘je ne comprends pas francais. parlez vous anglais?’ and I found that my French hosts once they knew I was English simply switched languages (something I am in awe of) though I did use my French language skills wherever possible. With my number collected I headed over to get some SainteLyon socks and my new much loved Buff! And from this point I actually had some free time. I headed over to the huge shopping centre and picked up some provisions, did some late night sightseeing and then continued in this vein the following morning – touristing before settling down to an afternoon nap before the race. I then engaged in my now infamous pre race coffee ritual for a full bowel clearance and eventually I’d get round to loading up my kit up! It all seemed to be going far to smoothly. At about 6pm I headed down to the bus pick up point and joined the queue for one of the many buses to St Etienne. I remember in 2015 the bus was warm but the window had a drip running down it and I’d worked hard to ensure I didn’t get wet! This year the bus was a little chillier but the window didn’t leak and we arrived in good time and without incident. Security was speedy but thorough and as I had time to kill I grabbed some of the pre race snack goodies and went into the smaller of the two halls to see if I could catch a bit more sleep or at least rest. The hall was warm and filled with people but I had little trouble finding space and I folded a buff up and lay my head upon it – but I couldn’t sleep. The SainteLyon was effectively my Christmas present to myself and like a young boy I was desperate to open my present and get to running! Much like a Christmas Eve the following three hours dragged like the Hundred Years’ War! Still the hours did give me a vantage point for kit and people watching – the most interesting outfit I saw was a teenage mutant ninja turtle with full shell and this chap (as far as I know) ran the whole thing dressed like this. The STL though doesn’t attract a great deal of runners like this, they’re quite rare I would say. Most runners rock up in their favourite or best kit and I was pleased to note that many of the runners were wearing Oxsitis, Raidlight or Kalenji bags, undoubtedly the French appreciate these brands being reasonably readily available on the high street and support local brands. Shoe choices were equally local with most seeming to opt for Salomon or Kalenji – the good thing for me was I saw no Karrimor! I’d chosen Altra for footwear and my beloved Oxsitis Hydragon for my back with a variety of OMM and Ronhill kit making up the rest, perhaps it was the kit that made me stand out as English as anyone that approached me spoke to me (generally) in my native tongue – clearly to the other runners I was not French! Anyway to the race! The SainteLyon in its current form is a 72km race from St Etienne to Lyon, taking place the first weekend in December and setting off around midnight, you can read more about it here at Wikipedia. At around 11.30pm I drifted slowly to the start knowing that I would be starting near the back of the field but this would allow me to pick off runners later on (if I had any capacity to do so). The organisers though were releasing the runners in waves which meant that as I was at the back I would be one of the final runners to depart St Etienne. I could feel the cold setting in and I was geared for minimal warmth as I knew that during the race I would overheat with too many layers. I rubbed my arms periodically to retain warmth and hugged myself, while gently jigging on the spot – stopping sporadically to take photographs and make social media checks. 40 minutes later and, as promised, bang on time the music played, the horn blew and thousands of runners were released into the night. It was as magical as I remembered it, only this time there was no @kemptomslim to share the moment with and so I turned to look at the arch I had just run under and said ‘au revoir’ before turning on my heel and running into the Rhône Valley night. The first few kilometres are along the roads and lack any really interesting things to note other than the opportunity to catch some ground in the runners ahead of you or perhaps make some alliances to allow the hours to pass more pleasantly. I decided on the former rather than the latter and pressed firmly ahead knowing that conditions underfoot later in the race might slow me down. Perhaps the big clue as to the conditions was the fact that many runners had loaded up crampons to their race vests in preparation for cruddy conditions but at this early stage even those in their Kalenji Road shoes were running fine. While my French is limited I could feel the ambience of the race and the runners and there was a generally positive, goodwill feeling that swelled up around the runners in these early stages and you couldn’t help but be carried by this. For my part I darted between runners and ambled towards the trail which kicked in at around the 6km mark. From here the light snowfall that we had seen on the sides of the road was replaced by much thicker, more dangerous, not so grippy snow and I recall as I headed down the trail that ‘bugger, this isn’t going to be as easy as last time’. However, I am confident in my footwork and I was able to press on a little faster than those in front of me and as the kilometres marched downward toward the first checkpoint I started to feel very confident about running a good time. Despite a lack of training in the lead up to the race I was feeling surprisingly spritely too and as I hurled myself up and down the trails I was enjoying myself. I felt like I was in a good place and set myself up for cruise control to allow me some breathing room and to take photographs and simply to take joy from the experience. About 13km in, not long before the first checkpoint I looked behind me to see the procession of runners all twinkling behind me and then I really remembered why I love this race so much. I remembered that post checkpoints I was freezing cold for the first few minutes and so covered my fingers with the mitten part of my gloves and pulled my neck buff up and my head buff down and headed out. Weirdly though my nose was freezing and when I felt the front of my buff the snot and hot breath had frozen into a cold and icy mess. I folded it down a little and it was better but this would be the first buff to be replaced a few more kilometres down the trail. and so I ran were it was appropriate and walked as quickly as possible everywhere else. It was about the 20km mark that I heard the sounds of an Australian accent behind me and for a short while I’d met someone who spoke English natively and we had a lovely brief chat before we went our sort of separate ways. This was her first ultra marathon and her French friend felt this would be a great introduction to ultras and when I saw her she looked the business taking her fast marathon form into the STL. I would see a little more of her later. The second section unlike the first had a greater degree of pure Trail and both my knees and back appreciated this. The trail was incredibly variable with some being good clear trail, other parts moist but most were snow and ice covered and progress remained slower than I would have liked but still not bad. The STL though has a very interesting aspect to it that say something like the CCC does not – overtaking. Although the route is busy with runners the potential for overtaking is enormous and you find yourself gearing up past runners all the time and then being overtaken by them! This has benefits for the relay runners who are undoubtedly fresher than the full distance runners and even for the Express (44km) runners that you might meet. I found myself hitting some decent running in this section and engaging in lots of overtaking and being overtaken and it was fabulous hearing the phrase ‘a gauche’ or ‘a droit’ – I can’t tell my left from my right in English so I had to concentrate hard to get it right in French! Although not clock watching I was very aware that my time was better than it had been in 2015 and some basic mental calculations suggested I could shave off around two or three hours from my previous outing and despite an injury and illness hit few months I was giving it as much welly as the ground would allow. However, all of this was to grind to a halt and all the good work undone. At about 23km in the ground became so icy that runners couldn’t even walk on it and in front of you a plethora of bodies were strewn across the trail. A runner would fall and the phrase ‘ca va?’ would be called the two or three runners that would stop to pick up their fallen comrade. I brought my own race to a stop to assess the conditions and decided that I would use what visual clues I had before me, track the steps of the runners ahead of me and go as carefully as possible. Sections were becoming so severe that runners were sitting on their arses and pushing themselves down the trail on their hands. I witnessed bloodied and bruised runners ahead of me but their tenacity meant that most would get up. My problems intensified though when at 26km my trusty Altra gave into the ice and I was thrust skyward and came down with a thud. I’d broken the fall with my back and smashed my headand although I got up straight away I was in pain – my recent back troubles suddenly came rushing back and my head felt woozy. I knew that Sainte-Catherine was only a couple of kilometres further on and so I followed the crowd, walking now and not in a good place. I slipped and slid more, desperate to keep my feet but I fell a further three times before the second checkpoint and when I crashed in I felt like death. I took a few minutes and ate emmental and salami to help get something in me and for both the first and last time I wondered if I should stop and seek medical attention. The answer was ‘no’ and with that I set off again. I tried to focus on the trail and ran reciting song lyrics and poetry to myself as I’ve often found this works to stop me thinking about more painful distractions. The various falls though and those to come had given me s kicking and perhaps had my head taken a worse knock than it did I would have had the common sense to stop – but I didn’t. The trail continued to worsen and we were now into the coldest part of the night and at the highest, often most exposed points, when the wind whipped through it passed straight through me but I refused to put additional layers on knowing that this would simply infuriate me. Upon reach Inge the highest point of the race I felt something of an achievement, despite having run it before I convinced myself that the rest of the course was downhill but this was ridiculous and actually the most dangerous Running was just around the corner. I could see the pack starting to gather ahead of me, the ice, once again so bad that runners were sat on the floor dragging themselves down and the mountain rescue, aided by quad bikes were going back and forth collecting runners from the trail. In my head I refused to sit down and drag myself along, I refused to bow, in my head I could here Terence Stamps, Zod calling out, ‘kneel before Zod son of Jor-el’ and although I’m no Superman i knew that the moment I gave in I would death march this home. My decision to stay stood cost me a couple of falls and a fellow runner came sliding into the back of me taking me out at one point. My already broken body didn’t have the required agility to jump straight back up this time but my fellow runners pulled me to my feet quickly and set me on my way. I was hurting now in lots of ways but the mild delirium kept me on the straight and narrow! I dragged my sorry arse into the checkpoint and found a quiet spot to change head torches and power my phone up after the cold had simply switched it off. 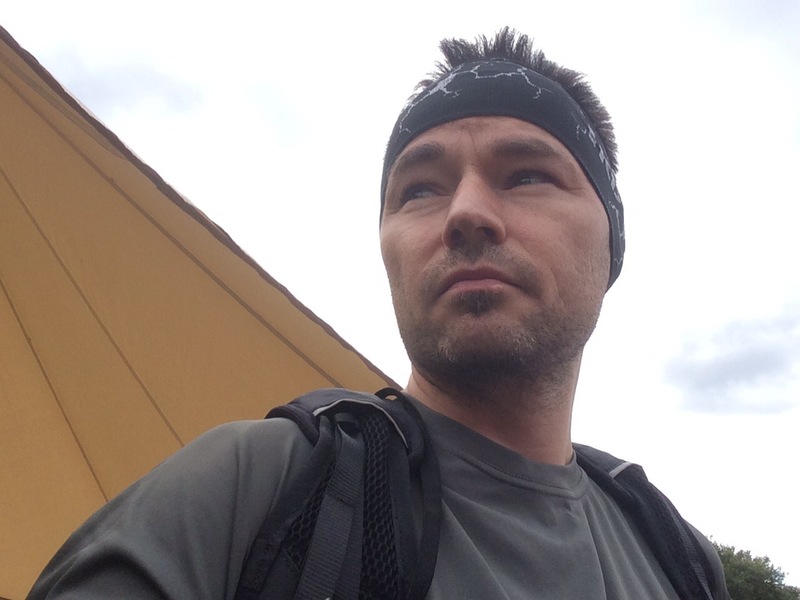 I didn’t bother with food or drink here – I was feeling sickly but I hoped this would pass if I quickly got out of the checkpoint and avoided the dreaded DNF. I was a marathon or so in and light would soon be upon these beautiful French lands and with it I felt conditions would improve if only because I’d be able to see but the news was a bit better than that – the closer to Lyon we got the better the trail conditions got and icy conditions became more sporadic. My head was also starting to clear a little bit and despite the physical pain I could feel myself running more and more with confidence returning that I could control both my ascents and more importantly the descents. Finally after the drama and trauma of the night I was back in the race – although the slow progress through the ice had ensured that there was no way I was going to run faster than the previous attempt. We were also on the countdown to the finish ‘SainteLyon 25km arrivee’ I pushed on as fast as I could, walking the hills as quickly as possible and staying steady across the flat and downhills. I stopped briefly to top up my calories with a couple of caramel Freddo and some icy water and took a look back to realise that there still many, many runners behind me – this was clearly proving a hard slog for everyone. With 20km to go I pulled into the next checkpoint and pulled out again quickly – I’d been keeping tabs on the young Australian girl and her friend who I’d inadvertently been playing overtaking tennis with and decided that I could use her as my pacer – the aim? To beat her to the finish. The final 20km are much more road based which doesn’t really suit my running style nor my injury record, however, it did allow me to push on without too much concern for what was happening at foot level. about 5km in to the final 20km I saw my new target drift ahead of me – still looking strong and here I thought it was all over, I didn’t have a race in me – or so I thought. With just over 10km left I entered the final checkpoint had arrived at the outskirts of Lyon. I saw the two runners I was trailing and asked how they were getting on, they described a tale of woe in the icy conditions and my internal Schadenfreude said, ‘hehe’ but instant karma paid me back by making me bite down hard on my own finger instead of the cheese and salami I was holding. I base them farewell and wished them a good final push but I knew I could get there before them. Finally the sun was warming, I removed my buffs, my gloves and rolled my sleeves up. I knew the route from here, I could smell the finish line in the distance and even the good awful climb into the city I flew up much to the amusement of runners behind me. There are steps on the descent into Lyon and the finish – lots of them and ahead of me I could see runners gingerly hobbling down them but I pushed hard knowing that I could continue to climb the rankings. I had decided on my finish routine long ago for this race and I ambled along to the final 200metres, I could see runners ahead of me and at the right moment I pressed my feet into the floor and like a rocket I blasted off much to the surprise of the crowd who whooped and hollered as I hit full pace. 1, 2, 3, 4, 5 runners down, runner number 6 with his hands in the air smacked me in the head but I was in full glorious flow and I hurtled towards the final turn – taking it wide to ensure I could cross the line flat out! I passed a couple of final runners at the line and I was over. It was over! I was over! The STL is possibly the best organised race I’ve ever run, but then after 64 editions perhaps that is to be expected. However, they clearly keep on making minor corrections to the system to ensure that runners know what’s going on and what they have to do. Things like transport to the start for thousands of runners is slick and well rehearsed and the checkpoints although busy are all easily accessible as a runner. As a French classic there isn’t much information in English but Google translate is helpful and the volunteer army was amazing in helping me with questions I had. There was also excellent social media connectivity and the tracking was quick, up to date and working unlike at so many events (yep I’m thinking of you UTMB). The STL scores incredibly highly for organisation. All volunteers are amazing but the SainteLyon volunteers are out in some freezing cold conditions for a very long period and they remain hugely upbeat – they are a credit to the race and to European Ultra Running. There should also be a special mention to the many people who came out on to the course to support, whether they had a runner or not, truly special. The route had something for everyone whether you’re a trail lover, a road hog or somewhere in between. The ascents are sharp and the descents technical in places but it’s fun and the route is mostly wide enough for easy overtaking. The views for this route are strange in that you are in the middle of the night so it’s dark but the lights of the runners illuminate things around you and in the distance and that’s a beautiful sight. I feel very much the reason I love the STL so much is because the route is both challenging and fun, this time it really did show me it’s tough side but that doesn’t change my opinion that this is an everyman course and with a bit of tenacity you can do it. I would love, love, love a SainteLyon medal but solo finishers are presented with a T shirt instead – a nice technical shirt but still not a medal. This year pre-race they also supplied a snood/buff and a pair of STL branded warm socks which are excellent. There were all sorts of other goodness such as the post race and pre race food (I didn’t bother with either but I heard good things about it). All in all the awards are great but I’d love a medal (take the hint organisers). To give an indication of cost I paid around £85 return flights (London Luton – Lyon). £22 for the return express train to Lyon from the airport and about £85 for three nights Airbnb in the centre of Lyon as well as £60 for the race and transport. Other costs included a couple of technical SainteLyon t-shirts and a bobble hat (total cost £27). All in, transport, race, goodies, tourism and food £300. I’ve written in my previous STL about logistics but Lyon is 1hr 25mons from London and Lyon Airport is 30 mins from the city centre. I used AirBnB for accommodation which was lovely and the race itself provides buses to the start for €13 and this is easily the best way of arriving fresh at the start. The organisers and Lyon/St Etienne are very well prepared for this event and as far as I could tell it runs smoothly and logistically brilliantly. Value for money is a very subjective thing, for example some people even believe that OCR events are good value but this is a different kettle of fish. Entry is €63 – this includes the €3 service charge and what you get is not only a truly glorious event but also tremendous support (be that through volunteers, cheering supporters or food at checkpoints), most importantly though you receive a brilliantly organised event and having some events not this well set up I can tell you I appreciate the value of a good team delivering on their promises. This year was a little different to 2015 but it had no fewer highlights, below are five moments that really made a difference to my race. Standing at various high points of the route and looking back to see the procession of lights running to catch me and the people ahead of me. The cries of Allez! Allez! Allez! and Bravo! Going back to the SainteLyon after 2015 was never in doubt. I had loved the idea of it and loved the execution of it. After being busy with Haria Extreme in 2016 I knew I would be returning to Lyon this year but what I hadn’t been prepared for was a hugely different experience. In truth, as I look back on it, I enjoyed this year even more than my first time because of how close I came to failing and yet still clinging on. However, it wasn’t just that it was also the fact I got to enjoy the race, to watch the landscape move before my very eyes in a procession of light and because the SainteLyon continues to tease, ‘come back UltraBoy you can run me faster’. Going back to the SainteLyon is a certainty because there is something special about it that no other race I’ve done has given me the feeling I get here. It might have left me broken into a thousand pieces but I would rather that it was body broken than my heart. SainteLyon 2017 – I loved you. You can learn more about the race at www.saintelyon.com and below is a gallery of images taken during the 2017 event! 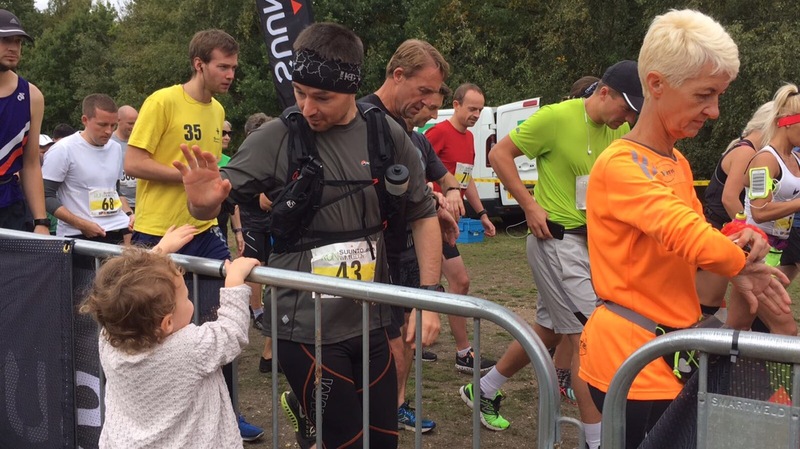 Review: Suunto RunWimbledon Marathon – over the hills and round that way? Some days you’re really up for a marathon and other days you simply aren’t. Thankfully I’d really been looking forward to the Suunto RunWimbledon marathon as it was a chance to properly test myself after a few months out and also test the back injury that has been plaguing me since late last year. For the first time in ages both the GingaNinja and ASK rolled up with me to the start line near the Windmill Museum and we sat on the grass in the early autumnal sunshine having some lunch and bimbling round on our balance bike (the toddler, not me). The race village was excellent and served as the hub for runners coming in and out of the event. Suunto had a significant presence as the events main sponsor but otherwise this was as low key as you like. Prior to race start I had the good fortune to bump into @Totkat – fresh from her self supported adventuring from Lands End to John O’Groats. It seemed we were both there for a bit of Marathon tomfoolery rather than going out hard. That said when the horn went off at 2pm I found myself pushing out on to the trail and following my tried and tested method of flooring it for the first half and then dropping off or exploding for the second half. The route was four laps of winding in and out of the trails of Wimbledon Common and there was a combination of lovely downhills to get your feet moving, a couple of minor uphills to let you have some hurt and some duller connecting trails to keep you on track – all in all not a bad route given the size of space being worked with. I pressed on through the field, trying not to pace myself against anyone else as I knew that many of the runners were liable to be a) relay marathoners or b) just better runners than me and every time I felt myself speed up I tried to calm myself down and slowwwwww up. About 3 miles in it became quite clear that I hadn’t had my pre-race dump but this, for a change, didn’t concern me too greatly as I knew that at about 4 and a bit miles in there were portaloos. However, when I arrived into the race village there was a significant queue and I was running pretty well so I pressed on into the second half of the lap. I think it would be fair comment that the second half of the lap was significantly less interesting than the first half but it did give some nice long stretches of path that allowed you to open the taps a little. 15 minutes I was back in camp and looking towards the loo. Once more though my hopes were dashed and with a quarter of the marathon run in a little over 50 minutes I was keen to get going again. I stopped for water and a bottle refill but there was no time for the loo – I’ll deal with this on lap 2! I drifted around the course attempting to maintain my pace but with my already listed toilet problem this was becoming a challenge. 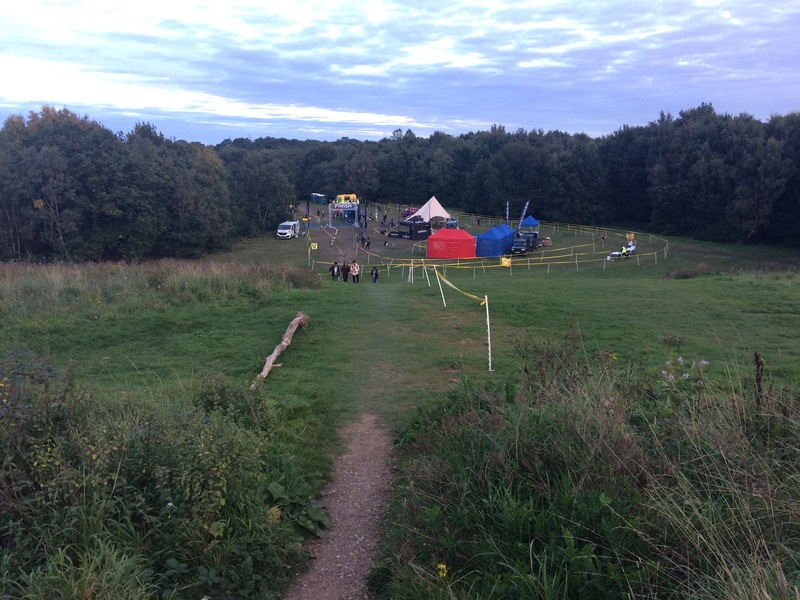 However, an option presented itself on the lap – the Wimbledon Common cafe had a toilet that was only a couple of hundred metres off the route and if there was still a queue when I got to the halfway point then I’d try that! Of course there was a queue! And so with the clock ticking I pressed quickly to the spare toilet a mile or so away. Needless to say I lost some time and when I came out of the facilities some 20 minutes later I knew that a good time was looking beyond me. I ran into the race village feeling much relieved in the bowel region but had now begun to notice that my groin was groaning from a distinct lack of fitness and my back was aching from what could have been the start of my injury seeking revenge. Effectively I was slowing and not even the smiling ASK and GingaNinja could lift my spirits – I was just going to have to grind this out. The one thing the race was missing on the support table were some sweets or slices of fruit and so I was very glad I had my own reserve and took onboard some Haribo and a children’s fruit pouch. The third lap was my worst and I just couldn’t get going and no matter what my heart was saying my head was saying the opposite but as I crossed the trails and heard the sympathetic applause of several dog walkers I determined that I must make a better effort and so I stopped – massaged my groin for several minutes and lay on the ground to stretch my back. This had enough of a desired effect that as I set off on the final lap I actually felt better. Mentally I was back in the game and while my groin was pretty knackered I was running consistently! There were now very few runners out on the course – there hadn’t been that many to begin with – but I found it in myself to overtake a couple of people and get round. Even the hill overlooking the race village was mounted with relative ease and I pressed downwards to the final couple of miles. ASK was awaiting me and I had to explain I would be back shortly but she could run the last few hundred metres with me if she wanted (in training for her race the following day). We had a little cuddle and she told me she would, ‘still be awake dad, it’s getting dark but it’s not bedtime yet’. With those words ringing in my ears I hammered home those final couple of miles and when I came up to the 200 metre marker she was waiting for me. Given that the ground was uneven i insisted she held my hand but we thundered our way to the line. ‘Faster dad, Faster’ came the familiar line as we raced across the line to the sound of cheers from the volunteers, event staff, and the remaining runners and supporters! I think ASK was happier than I was at the conclusion of the race as she was awarded a medal for an outstanding sprint to the finish. But ultimately despite the challenges I personally faced on the day this was a damn fine event. As I’ve already indicated the route was interesting without being spectacular, ultimately you’re in a borough of London – how exciting can you make it? but it was a very well thought out use of the space available. For me the best bits were when the trail tightened up, ran through the dirtier trails and forced you to beware but for many this would have been a lovely introduction to trail marathons. Interestingly despite being a trail event this felt like a fast event with good times perfectly possible – worth noting for the trail speed demons. Those who put on the Suunto RunWimbledon had a good plan and stuck to it. The placement of drinks support was excellent and you passed the table twice per loop and having a race village in the loops middle actually made this a jovial affair. The volunteers were universally excellent and for the most part the organisation was perfectly invisible which allowed the runners to simply get on with the job of running. A new Salomon neck gaiter/buff, a decent bespoke medal and drinks – you’d be hard pressed to grumble. 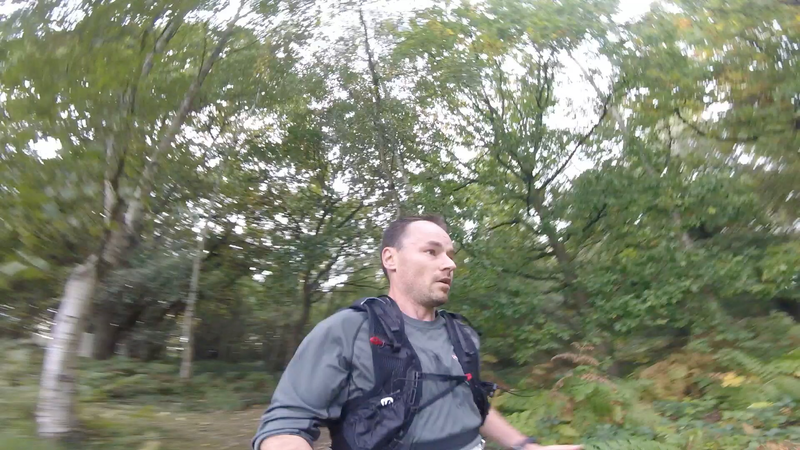 £35, 4 loops of a well thought out course, excellent support and little extras like the neck gaiter – yep this one would score highly on good value. The Suunto RunWimbledon Marathon is an excellent trail running marathon that is well organised and well supported – with the addition of the half marathoners and 10km runners the field felt quite nicely full but never so much as to feel crowded. I’d say that if you were looking for an early autumn marathon near London then this one would have to rate highly in your choices. The question I often ask myself when I review races is ‘would I do this again?’ and in this case the answer is yes.